Harsh words from the International Road Transport Union as drivers caught in the continuing farmer blockades in France are threatened and have loads trashed, plus a roundup of the day’s events. Also, a quick look at driving to Rome. Encouraging news on Calais strike. Bus stuck on Trollstigen. Fuel tourism falling in Luxembourg? Migrant deaths settle into uneasy pattern in Calais. Farmers blockade Lyon as truck union blames ‘total French incompetence’. Farmers made good on their promise to blockade Lyon last night. They have maintained the action on the A6 to the north of the city centre – completely closed both ways to the A46 ring road in both directions – all day, and the inbound section of the A42 to the north east of the city centre. It seems they are also making good on their promise to call off the strike in Lyon this evening though there are few concrete signs yet. Even when they do leave the roads will take some time to clean up. The early block on the A7 northbound into Lyon did started to give way from mid-afternoon however even now it should be avoided. Drivers can divert around the city on the A46 and A432 (but not the N346). Thankfully threatened blocks around Clermont Ferrand failed to materialise, so far, though there was a determined effort on the A75 just south of Issoire, and another smaller scale block remains on the A75 just south of the city. In general the action has continued to shift south today. The N814 Caen ring road was freed last night as was the A84 at Avranches, along with the D117 up to St Malo. Both the A29 Pont de Normandie and A131 Pont de Tarcanville in Normandy were back in use just after lunch. The stubborn blocks around Brest, Quimper and Morlaix in Brittany remain, to the best of our knowledge, as does the road block to Mont Saint Michel. Meanwhile, the International Road Transport Union (IRU) has issued a very strong statement calling for immediate action to ’guarantee freedom of movement in France’ after many reported instances of truck driver intimidation and wrecked loads. CETM, the Spanish Confederation of Goods Transport, also ‘denounced’ the ‘passivity’ of the French government today after a succession of incidents. As well as one milk tanker which had its contents sprayed over the road in Brittany, and another vehicle carrying pork ‘attacked’ by a group of farmers in Normandy, a driver was assaulted near Poitiers in the past few days for refusing to open his truck, apparently while police stood by. 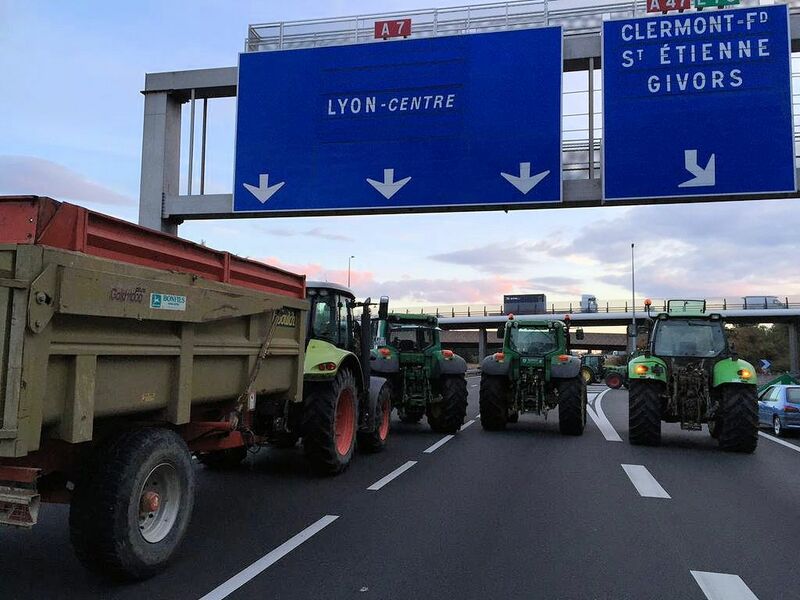 Recap: farmers mounted the first road blockades around Caen on Sunday night. Since then the actions spread around Normandy then down into central France. The strikes continue despite a new €600m emergency aid package for farmers announced yesterday. Meanwhile, it seems a deal is in the offing between SCOP – who previously operated the MyFerryLink ships – Eurotunnel and DFDS to end the month-old Calais strike. Brokered by French minister for Transport Alain Vidalies, the nine point plan includes DFDS – slightly – upping its job offer to former MyFerryLink employees, while the single ferry retained by Eurotunnel will be operated by a new SCOP. None of the parties have exactly welcomed the deal but none have rejected it outright according to La Voix du Nord. If the deal is signed at a meeting early Monday afternoon, the two ships currently occupied by MyFerryLink strikers will be released to DFDS. Throw back Thursday, Rome April 2010. 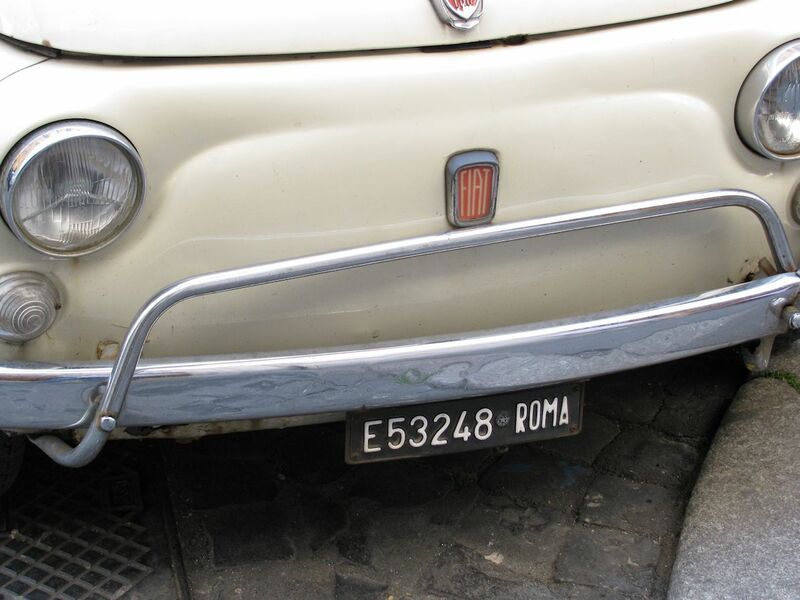 Rome is 1050 miles from Calais the direct route, via Dijon, Mont Blanc and Milan. We headed via Maastricht and Innsbruck for an extra 100 miles, and back through Lugano, southern Switzerland, and Brussels (actually 1049 miles). Photo @DriveEurope. roundup: NORWAY. Trollstigen shut for three hours at lunchtime today after a coach got stuck on the way down. The smart tri-axle Byberg & Nordin Neoplan Starliner from Nordingra in eastern Sweden was wedged on one of the eleven hairpins. No doubt the road inspectors will have their measuring sticks at the ready; vehicles longer than 13.1m long are banned (though a special 12.9m version of the now discontinued Starliner was available. Apparently). Probably Norway’s best known road, Trollstigen is to be found on National Road 63 between Andalsnes and Valldal in the south west. EUROTUNNEL. A sad pattern is emerging at Eurotunnel’s terminal in France. If the trains are disrupted first thing in the morning – as they most often are – it is down to a migrant break-in. If the disruption carries on much after 07:00BST it means someone has died. After overnight migrant activity described by Eurotunnel as ‘intense’, the body of a man ’believed to be in his teens’, according to Kent police, was discovered in Folkestone earlier today after crossing from France. Along with an Eritrean woman killed on the A16 at Calais overnight Thursday-Friday, it brings the total number of migrant deaths to seven since the start of the month. LUXEMBOURG. As fuel prices yo-yo around Europe is the Grand Duchy losing its reputation as the Western European capital of fuel tourism? It’s too early to tell said the finance minister today – via Wort.lu – as he unveiled fuel sales down by around seven percent, and falling tobacco duty. In general Luxembourg has maintained its price advantage to neighbouring countries, see this week’s fuel report. Diesel discounts for trucks in Belgium, and a shift to public transport and car-sharing, are said to be behind the falls.